To enable integration with the Universal Content Management (UCM), Oracle provides ‘out of the box’ web service called – GenericSoapPort. With this WS you can execute operations like CHECKIN_NEW, DOC_INFO and more. 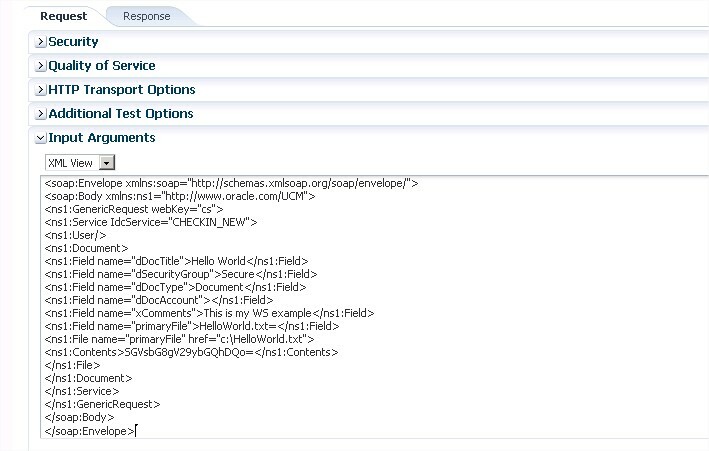 Attaching a policy to the WS is mandatory, as you will be obligated to add a SOAP Header user/pass. © Arik Lalo and ‘Oracle Fusion Middleware’ Blog, 2013. Unauthorized use and/or duplication of this material without express and written permission from this blog’s author and/or owner is strictly prohibited. Excerpts and links may be used, provided that full and clear credit is given to Arik Lalo and ‘Oracle Fusion Middleware’ Blog, 2013 with appropriate and specific direction to the original content.